When shopping for kids furniture for a medical office, you may want to consider waiting room couches so the children can sit with parents or with siblings while waiting their turn to be seen by the doctor. If your business is an office where parents often bring their children with, you should also consider using waiting room couches are part of kids waiting room furniture. In offices such as pediatricians, dentists and other doctors that often see children, you may want to choose waiting room couches that are durable and clean easily. 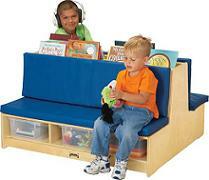 Children can be tough on kids waiting room furniture. Between sticky hands or an errant crayon or marker, the kids waiting room furniture could take a beating and you want something that will last a long time, even with excessive cleaning. You may also want to consider oversized chairs and chair/desk combinations for the reception office furniture. That way, the kids can sit at a desk and color while waiting for the doctor, and may not be as cranky, because they have something to do while waiting. Before you purchase kids waiting room furniture, take into consideration the age groups of the children and purchase the furniture accordingly. If most of your patients or clients are under the age of 10, desks and brightly-colored furniture make visiting your waiting room a pleasurable experience. For older children, over-sized chairs in bright colors give the kids a place to sit comfortably and read or play hand-held video games. Contact us to learn more about our selection of kids furniture, request a quote or place your order today.